The American people figured out very early in the health reform debate that you can’t create a new entitlement that finances health insurance for 30 million people and still claim the scheme will magically reduce the federal budget deficit. But the White House and Democratic leaders in Congress kept insisting we were wrong – that, like the subjects in “The Emperor’s New Clothes,” we were just hopelessly stupid if we didn’t see that the health law’s new garments were indeed dazzling to behold. 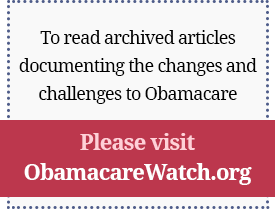 Now we have an independent study that exposes the naked truth about ObamaCare. The law is a fiscal disaster. Charles Blahous, a senior research fellow at the Mercatus Center at George Mason University, has produced a meticulous 52-page study, The Fiscal Consequences of the Affordable Care Act, which details the health law’s spending and revenue projections point by point. The inescapable conclusion: “Taken as a whole, the enactment of the [Affordable Care Act] has substantially worsened a dire federal fiscal outlook,” Blahous writes. The health law “should be expected to increase federal spending obligations by more than $1.15 trillion over the upcoming decade and to worsen cumulative federal deficits by somewhere between $340 and $530 billion over the same period,” he writes. The Obama administration had claimed the health law would lead to deficit savings of $124 billion over the first decade. Blahous is an expert in entitlement programs, having served as executive director of the bipartisan President’s Commission to Strengthen Social Security and later on the National Economic Council in the Bush White House. He currently is one of the two public trustees for the Social Security and Medicare Programs. His study looks at each of the major spending provisions in the health law – including huge new spending for private health insurance subsidies through the Exchanges and the vast expansion of Medicaid and the Children’s Health Insurance Program – as well as the projected revenues and savings — including new and higher taxes and cuts to Medicare through deep cuts in provider payments. Blahous concludes that the spending is likely to be very real and will dramatically swell the deficit while taxes and spending cuts are much less likely to materialize. But we commoners know the truth. Blahous’ scholarship is extraordinary. And it provides important and objective data underscoring one of the law’s many fundamental flaws: It double counts the fictional savings from Medicare. Health Secretary Sebelius got backed into a corner on this very point during congressional testimony last March. Rep. John Shimkus (R-IL) asked Sebelius whether more than $500 billion in Medicare cuts were being used to sustain the program or pay for new entitlement spending. The Congressional Budget Office released a memo showing Sebelius’ math was more than a little off. The Medicare money “cannot be set aside to pay for future Medicare spending and, at the same time, pay for current spending on other parts of the legislation or on other programs,” CBO said. “To describe the full amount of [Medicare] trust fund savings as both improving the government’s ability to pay future Medicare benefits and financing new spending outside of Medicare would essentially double-count a large share of those savings,” said the CBO memo. The chief actuary for Medicare has said the same thing. And now it has been validated by the Blahous study, providing three objective findings which show that a big part of ObamaCare’s (fictional) deficit reduction is based upon double-counting of Medicare savings. Now that this cloak has been stripped away, the U.S. Supreme Court has one more reason to conclude it would do the country and the taxpayer a huge favor by striking ObamaCare off the books and sending Congress back to work to stitch together a real health reform law. Posted on Forbes: Health Matters, April 11, 2012. Previous Article: When would it ever stop?